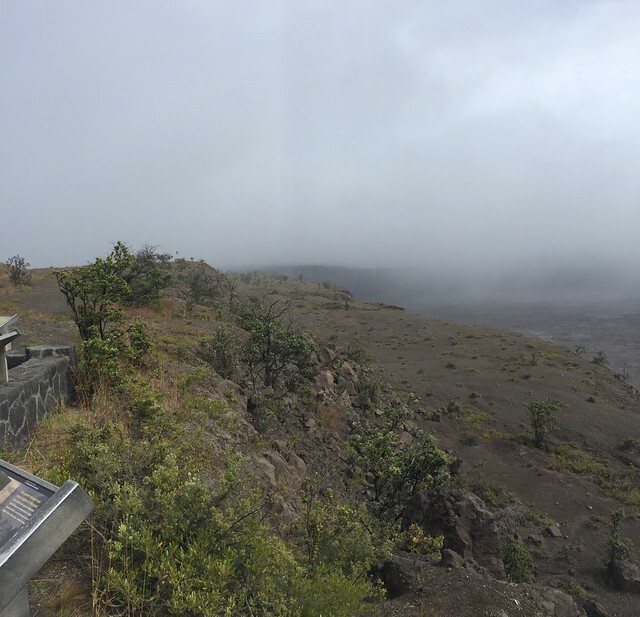 While on the big island we went over the top of the center of the island across the extinct volcano until we got to the live volcano at Volcanoes National Park. 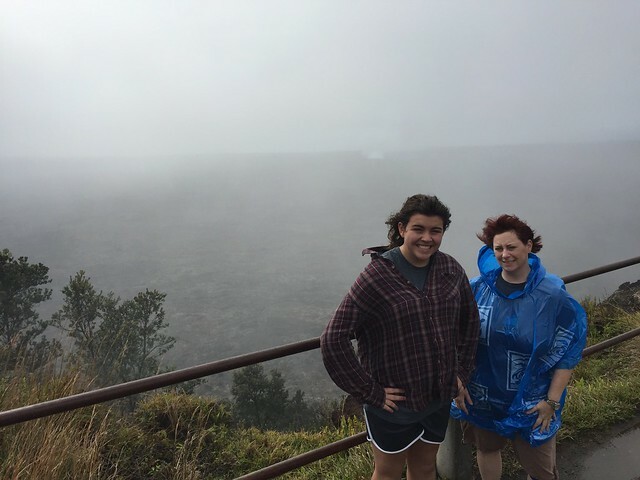 Here's my family on the rim near where the steam vents are. We didn't bring rain jackets or umbrellas so my wife bought a few at the ranger station. I think my daughter's and mine are still in the luggage unopened. 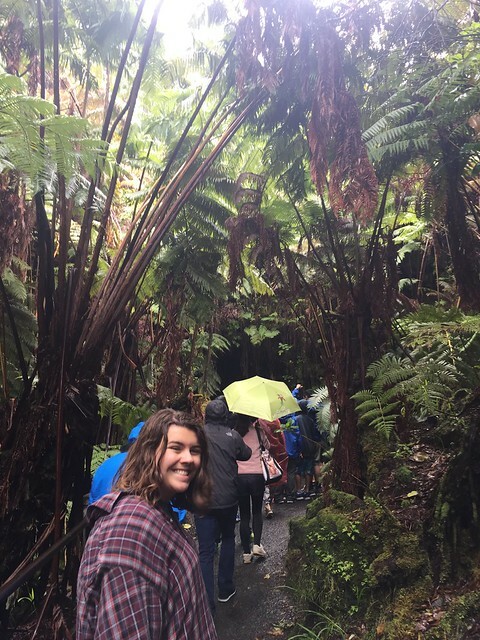 The way into the Thurston Lava Tube. On the way out, Pooteewheet ended up stuck with a tour group for a few moments looking at trees. I think some of those people ahead of us, although I remember them all wearing the same outfits and looking sort of like a cult. She fit right in. 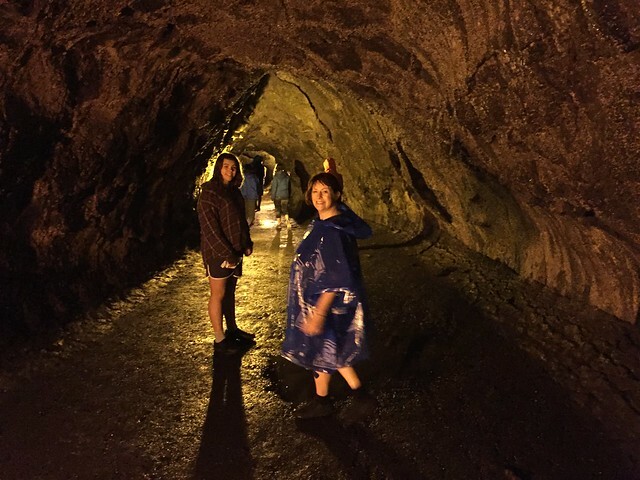 In the Thurston Lava Tube. Near the hotel there was another lava tube, unmonitored, and lots of people stopped to wander around in it. Seemed dubious. I wouldn't have been afraid of lava, but the idea of being under all that rock with an expert giving it a once over would make me nervous. 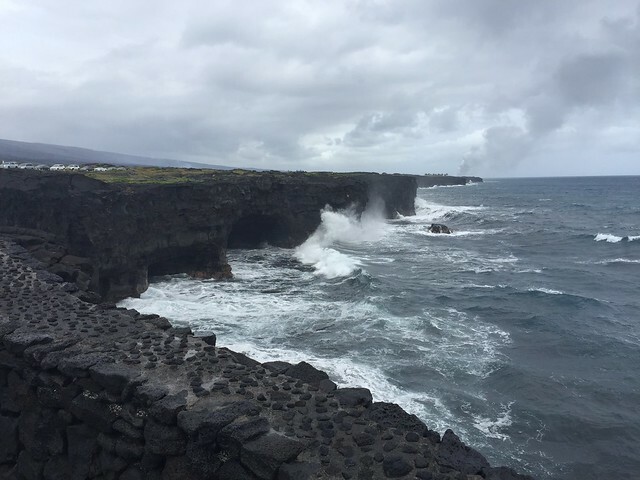 Up by the Jaggar Museum, overlooking the lava. 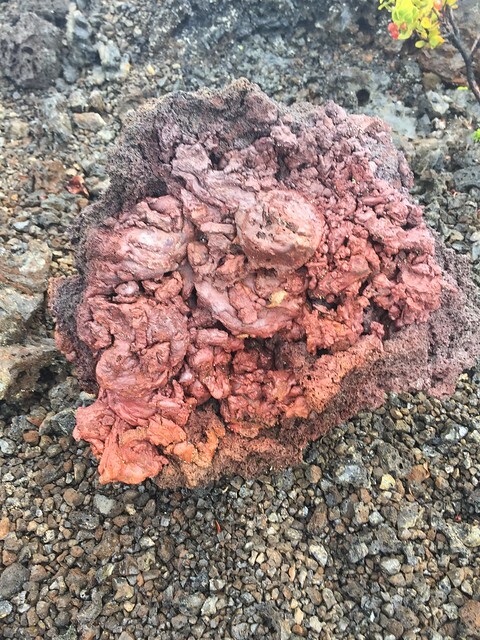 Here you can see where the lava is bubbling. If you stare really really hard, you might be able to see the glow. 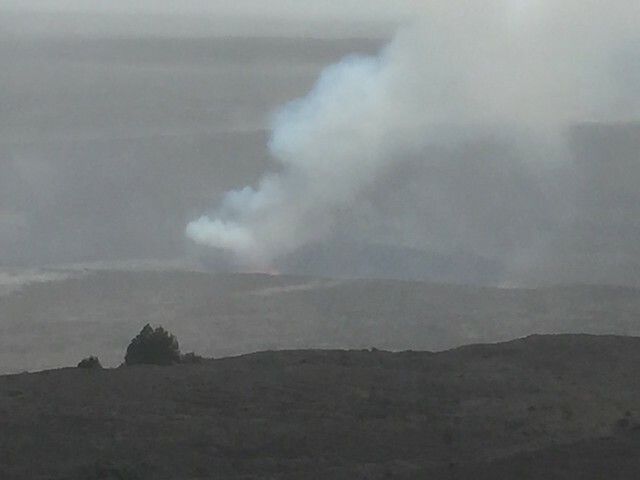 This is even closer - you can see the lava in this picture. If you can't, here's a link to the Original so you see it without increasing your screen resolution. And in Panorama - the link goes to a much larger panoramic view. 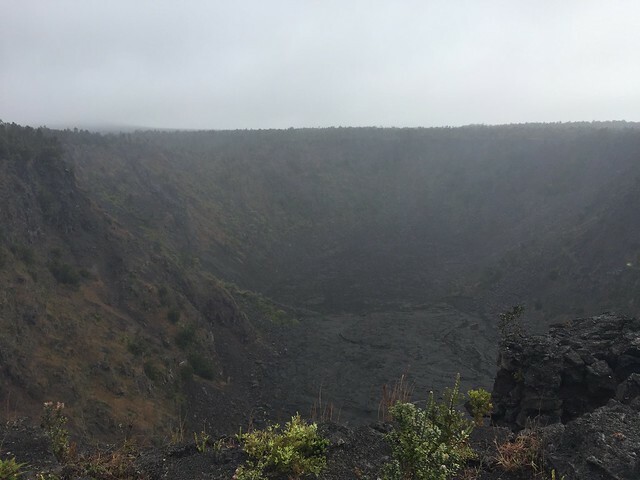 We headed down Chain of Craters road and stopped at the lava pits (sans lava). 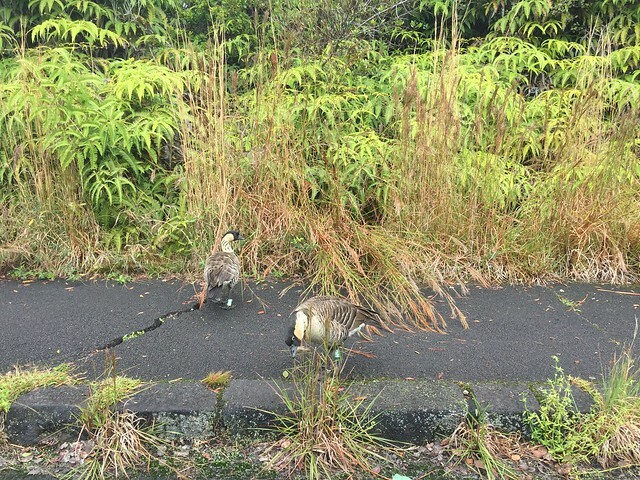 My wife and daughter were excited that there were live Nene, or Hawaiian geese. Eryn came back with a stuffed one. Not real slash dead slash taxidermied. But a toy stuffed nene. The Nene stop was near a big area with a crevasse and lots of big rocks. It was a neat place to hang out as there wasn't anyone around almost the whole time we were out there. We had it all to ourselves. Eryn and I originally thought that far rock looked like the Gorn rock from the original Star Trek, so we were trying to get a picture of us fighting for Mean Mr. Mustard. 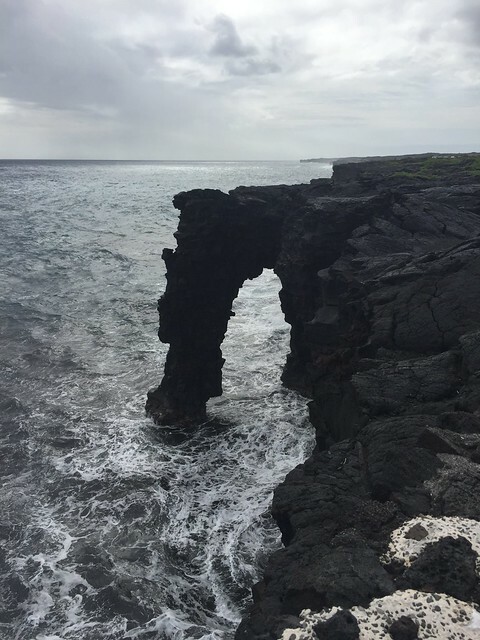 But the closer we got, the less it looked like the Kirk-Gorn rock. A random rock. These things were sharp despite looking lumpy. We saw a guy nearby from our car that had obviously fallen and cut up his knee. I'm surprised he was still moving around. And down to the sea caves by the Pacific Ocean. 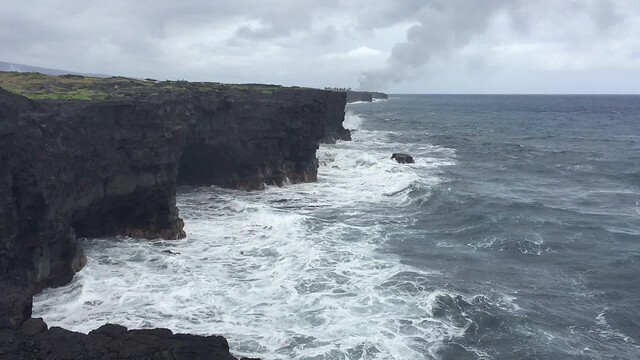 Off in the distance you can see where the lava meets the sea. You can't get there easily unless you bike from the back or hike in over hours. We didn't do that. 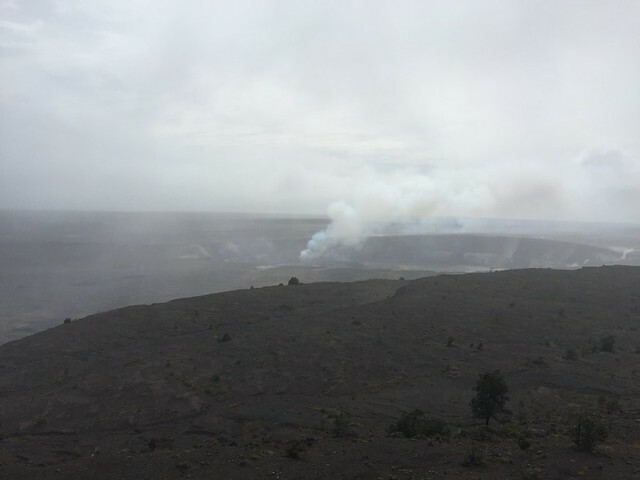 But my brother, nephews, and dad came back later to hike to the lava. 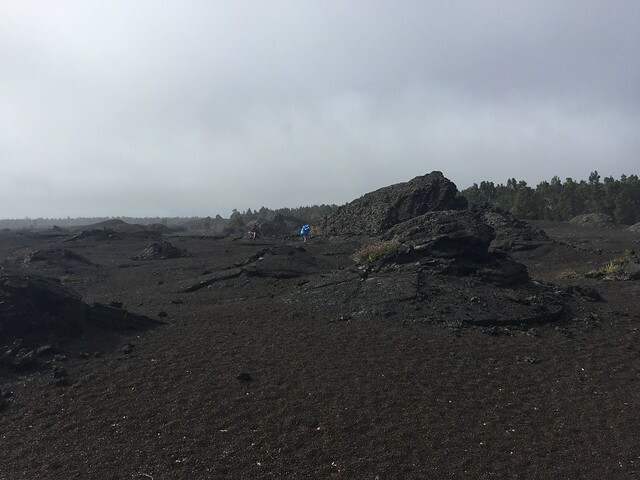 They didn't bring enough water or dedicated flashflights so from the hotel we were getting posts about batteries wearing out, getting lost on the lava field, and leaving phones in undesignated places. We thought it might all lead to tragedy. The video version so you can enjoy the crashing waves. 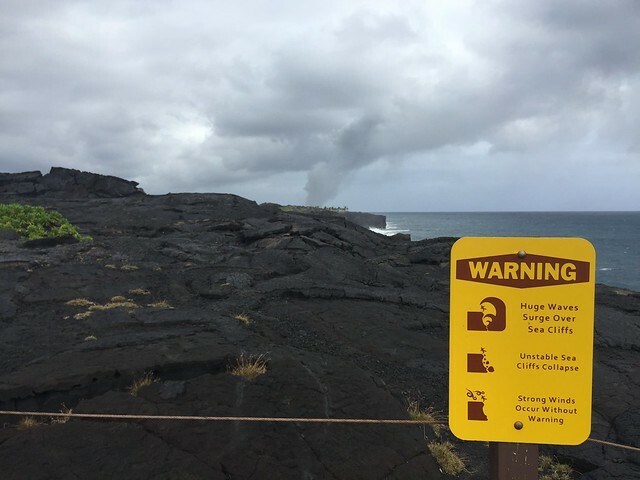 A better view of the lava steam plume with the warning in the foreground that you're in all sorts of known risks for dying, none of which are eruption or lava related.